The Government with a view to protect interest of farmers has also decided that there shall not be any deduction in case of mills where recovery is below 9.5%. Such farmers will get Rs. 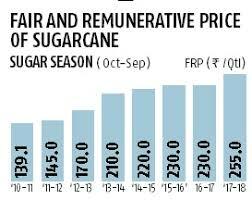 261.25 per quintal for sugarcane in place of Rs. 255/qtl in the current season. The FRP so approved shall be applicable for purchase of sugarcane from the farmers in the sugar season 2018-19 (starting w.e.f. 1st October, 2018) by the sugar mills.